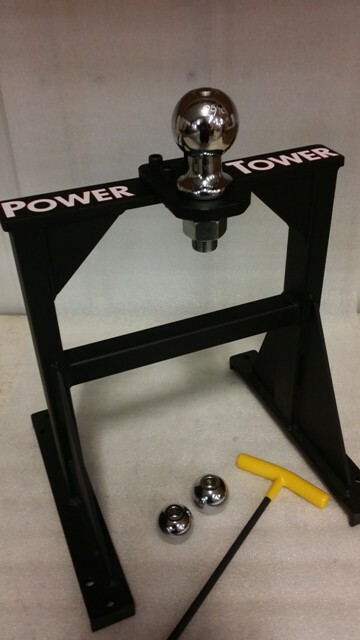 The new Power Tower, Trailer Moving option for converting select SuperTow models to handle Trailers. New for 2016! The Power Tower. This product is the trailer moving option for converting SuperTow Pro and Striker models to handle trailers. We recommend solid surface and no more than 5% slope for safe handling. Features a quick change trailer ball allowing handling of trailers requiring 1 7/8", 2", and 2 5/16" ball hitches. I purchased a Powertow pro this year as my travel trailer rental business grew. I needed the Powertow to move travel trailers around tight corners and into pre and post rental locations - all on loose gravel. I had bought another style of power mover in the past and it did not work well enough to use. The Powertow works perfectly! It is so well made and powerful and reliable. What a pleasure it is to use. I absolutely depend on it and am able to make firm expansion plans because I know I have a reliable way to handle the extra trailers. I would recommend the Powertow (and the people who make the Powertow) to anyone and everyone. Great company, Great products!